Product #21205 | SKU 583954 | 0.0 (no ratings yet) Thanks for your rating! Sigma's OS (Optical Stabilisation) feature allows you to shoot at shutter speeds approximately 4 stops slower than would otherwise be possible. This means your images will look sharper, even when shooting without a tripod in low existing light or at maximum range with a flash. 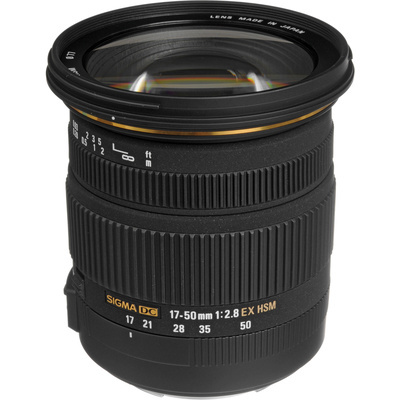 This lens is also equipped with Sigma's Hyper-Sonic Motor (HSM) which provides for fast and quiet autofocusing. The Sigma 17-50mm f/2.8 is ideal for many photo opportunities particularly landscapes and portraits, but with its wide focal range and a close focusing distance down to 28cm you can capture images with unique perspectives. It will quickly become one of the most important lenses in your gear bag. The DC designation on the barrel means that this is a special lens designed so that the image circle matches the smaller size (APS-C) of the image sensor of your digital SLR. Its specialised design gives this lens the ideal properties for digital cameras, including a compact size and lightweight construction. The 17-50mm f/2.8 offers Sigma's OS System (Optical Stabilisation) that allows shooting at shutter speeds approximately 4 stops slower than would be otherwise possible, for sharper handheld photography even in low-light situations.